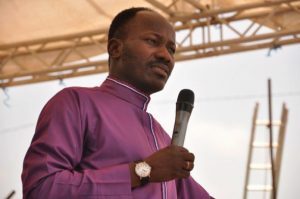 Whilst we are still in the middle of the ongoing to-tithe-or-not controversy, our popular Apostle, Apostle Suleman tweeted about increasing the percentage of tithes his members should offer. In case you don’t know; Apostle Suleman is the founder of Omega Fire Ministry who for the most of this year, has been through a lot of criticism. What should have come across as an audacious faith statement, obviously did not go down well with other tweeps who believe he went overboard. My only problem is.. why tell us?? If u want to do it.. do it. We don’t need to know what u have planned for God on a personal level. The purpose of telling the world is so his ignorant followers can also up their tithes. He needs money for Christmas. Who is fooling who? Wow! My father this is amazing. Me I am increasing too .we are going to run the devil out..Thank you sir. Oga. Satan cannot die naaa. Guy how many percent Bible talk sey make we drop? Abi kini gbogbo eleyi bayii? Your followers will see this and def follow, na strategy, we get. Apostle Johnson Suleiman blocked me. I am an advocate for do what you want because you are human first not because you are a pastor.